La Serre de la Madone - looks like the stairway less travelled to me. La Serre de la Madone - Il me semble que c'est l'escalier le moins fréquenté. Monaco has a new Princess! Click on Monte Carlo Daily Photo to read more. I would take this stair without hesitation. Obviously something changed. I agree with Mark. It seems to lead to an enchented place..I go too! 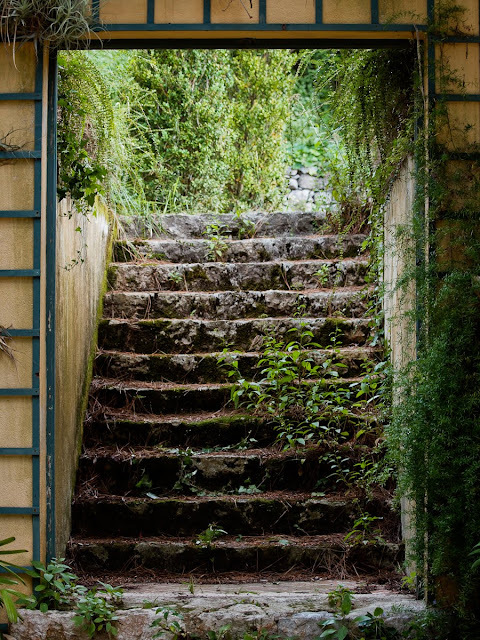 Even though it's a bit overgrown, it's still a very intriguing set of stairs that might compel you to explore! I imagine a slender ghost in a white gown ascending those stairs. You took the stairway less traveled by, and that has made all the difference. Magical photo. Nature is taking the stairs. I assume that somewhere nearby there is a wife telling her husband, "Dear, please do not forget to out and cut the stairs." I like Dave's comment: "Honey, go out and cut the stairs!" It sounds familiar. Oh Jilly you've captured the very essence of this mysterious staircase!